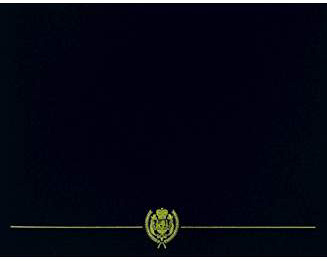 An unaltered photocopy of your DD-214 or other military issued document clearly displaying your award of the Korea Service Medal. Contact The War Library if you do not have a DD-214 or: 1-562-422-4100 (Pacific Time Zone). 1. Description: A Bronze medal, 1 3/8 inches in diameter, with a top view of the globe enclosed at sides and bottom by a wreath and the letters "UN" at the top of the medal. On the reverse side is the inscription "IN THE SERVICE OF PEACE". 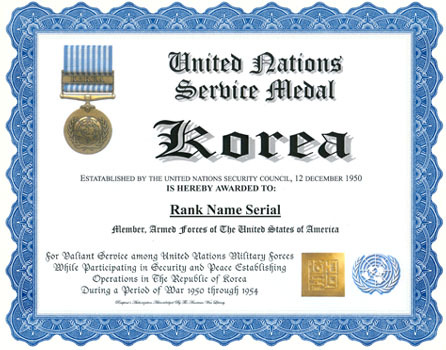 The United Nations Service Medal Korea is the same design, except the obverse does not include the letters "UN" and the medal has a hanger bar with the inscription "KOREA". On the reverse side of the United Nations Service Medal Korea is the inscription "FOR SERVICE IN DEFENCE OF THE PRINCIPLES OF THE CHARTER OF THE UNITED NATIONS". United Nations Service Medal Korea: Equal stripes of Bluebird 67117 and White 67101 (9 Bluebird and 8 White stripes), each 5/64 inch wide.